Good atmosphere, perfect in summer but never a destination worth travelling for. "Good atmosphere, perfect in summer but never a destination worth travelling for." Covent Garden is a dense forest of retail, restaurants and offices and while it primarily caters to shoppers and tourists, you can’t forget those who earn their money here. These are the people who fill the pubs along Endell Street, on the edges of Seven Dials and of course, on Neal Street where the Crown and Anchor overlooks the madness. Standing out from the rows of bright looking shop windows, the Crown and Anchor is a classic pub. With dark green walls, simple wooden furniture and just the odd picture for decoration, it knows it’s not winning any prizes for its tradition. But that’s okay because the people who drink here are the style. They decorate it. The after work crowd from the Covent Garden stores paint it with a contemporary look from the outside to the in. Summer means swarms of people clutching pints on the cobbled stones outside and winter shifts them inside for more of the same. Add shoppers and theatregoers into the mix and there you have the group of drinkers who contribute to the rowdy atmosphere here. While it only sticks to the basic requirements of cheap and drinkable house wine and standard lagers, this is an area – and the type of pub – where you wouldn’t expect anything more. 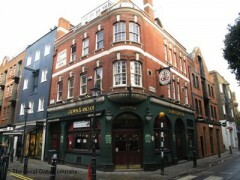 The Crown and Anchor is a destination pub only for those in its immediate vicinity. But what that means is a good atmosphere and something representative of a small Covent Garden community, which equals a good place to get a drink. While the Crown and Anchor wouldn't be on my radar in the winter, when it comes to soaking up the central London atmosphere in summer this is one of the few pubs in Covent Garden where you can join a big group in spilling out onto the cobbles and enjoying outside drinks. Somehow the generic lagers taste all the better when there's a big group congregating at 5 O'Clock on a Friday night.